If you are a new patient to our clinic, welcome! You can download our new patient intake form below. Please fill in the form and bring it to your first appointment. You can either print it off and fill it in with pen, or fill it in on the computer and email it to clearbrookchiropractic@gmail.com. All information collected is confidential and will not be disclosed without your consent. If you are new to Chiropractic please see our FAQ section for commonly asked questions and what to expect on your first visit. If you were involved in a recent motor vehicle accident and want to claim it as an ICBC injury, please fill in the following form below. 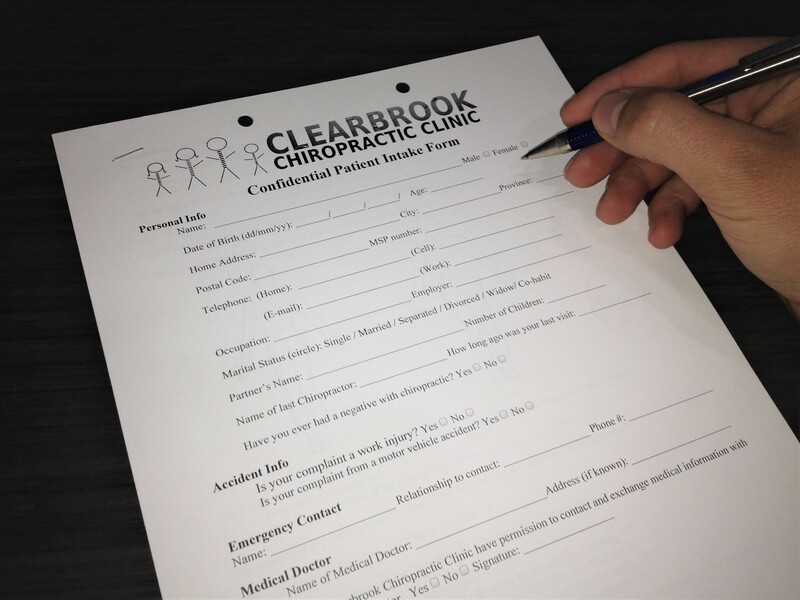 You can either print it off and fill it in with pen, or fill it in on the computer and email it to clearbrookchiropractic@gmail.com. Please let our staff know that you were involved in a motor vehicle accident so we book extra time for the examination. The last two pages of the intake form are required surveys by ICBC. They are used to monitor your progress with treatment, so try to be as accurate as possible and complete all boxes. Keep in mind that the Neck Disability Index only applies to neck pain (only complete it if you have neck pain), and the Oswestry Disability Index only applies to back pain (only complete it if you have back pain). If you were involved in a recent work place accident and want to claim it as a WorkSafe injury, please fill in the following form below. You can either print it off and fill it in with pen, or fill it in on the computer and email it to clearbrookchiropractic@gmail.com. Please let our staff know that you were involved in a work place accident so we book extra time for the examination. The last two pages of the intake form are required surveys by WorkSafeBC. They are used to monitor your progress with treatment, so try to be as accurate as possible and complete all boxes. Keep in mind that the Neck Disability Index only applies to neck pain (only complete it if you have neck pain), and the Oswestry Disability Index only applies to back pain (only complete it if you have back pain). Please note: Our office has a 24 hour cancellation policy. A $30 cancellation fee will apply to <24hr missed, cancelled, or rescheduled chiropractic appointments. The full treatment fee will be charged for <24hr missed, cancelled, or rescheduled massage appointments due to the limited availability of 60min time slots. Special consideration will be given to sudden sickness or emergency.